Don’t make a Charity pay for your Charity Walk! Many, many people climb Ben Nevis, Snowdon or Scafell Pike for charity – and a large number of Three Peaks Challenges are to raise funds for worthy causes. The mountains are challenging to climb, so what better than pushing yourself to the limits in order to help someone else? The problems start though when one person’s (or team’s) fundraising effort costs another charity far more than will have been raised for the one they were climbing for. If you have organised a team walk up to the summit of one of the most popular mountains in the UK you may have decided that come what may you’ll get to the top – and that will include what the weather throws at you. Just this week in the snow and icy conditions Lochaber Mountain Rescue came across three men in Superman costumes complete with capes attempting the climb. The cost of mounting a rescue on one of our mountains can be astronomical – if a helicopter needs to be called out it will cost £12,000 per hour of flight. If people get lost it is not unusual for more than one Mountain Rescue Team to get involved, which mean 45 rescuers and teams of search dogs looking for whoever is missing. 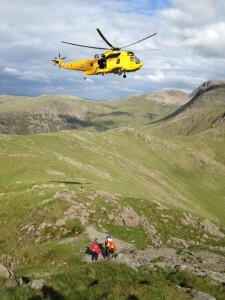 The last thing that the Mountain Rescue Team’s want to do is to spoil anyone’s enjoyment on the mountains. And they know better than most how important it is to raise money for charity – Mountain Rescue Teams are funded solely by charitable donations. So it is ironic when the reason for their call out is to rescue someone who is walking for charity when that rescue could have been prevented. All they ask is that people take sensible precautions and are properly equipped for the conditions – and if the weather is not looking good for the walk postpone until another day. Check that you have the proper equipment for the conditions (if ice axe and crampons are recommended make sure you have them and know how to use them). Getting to the summit of the mountain is an exciting achievement, but do try and get there safely. Of course no one can prevent accidents happening, and getting you down of the mountain safely is what Mountain Rescue is there for. But getting stuck or having a fall simply because you were not properly equipped for the conditions is plain daft – especially when you were doing it for charity in the first place. This entry was posted in Mountain Rescue and tagged mountain rescue, staying safe on the mountains, walking for charity, weather conditions, weather forecasts by . Bookmark the permalink.